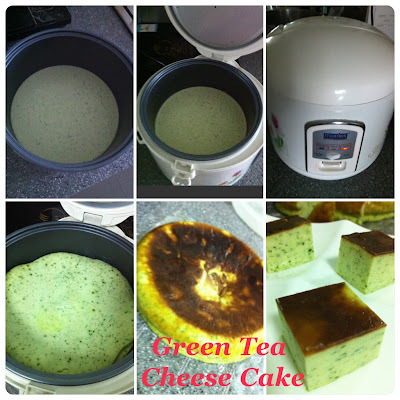 Was not feeling well for the pass 2 weeks and have no mood to switch on the oven to bake so I try using rice cooker to bake a cheese cake. Didn't expect it will work, when I remove the cake from the pot I saw the base was burn. It's a failure I think but I still chill it in the fridge for 3 hours. When I cut the cake it is soft like taukua, when I bite a small bit I feel the texture is in between toufu and taukua. Will be trying another recipe to bake using rice cooker - Japanese Castella. 1. In a mixing bowl whip up the cheese and sugar to light and fluffy. 2. Add in the lemon juice and egg and mix well. 4. Add in the cream and mix to smooth texture. 5. Coat a layer of butter in the inner pot. 6. Pour the mixture into the inner pot of the rice cooker and bake for 30mins. 7. Allow to cool before removing from pot. Notes: for the baking time it depends on the rice cooker use, for mine I have to press the button to cook for 3 times.